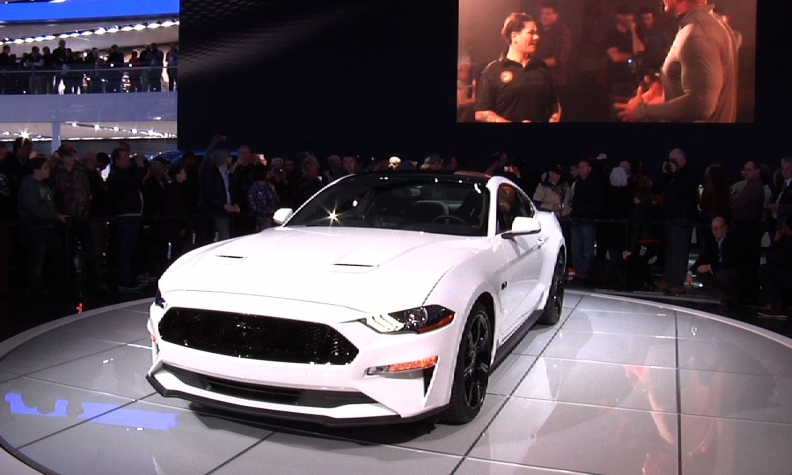 Designers lowered the hood on the 2018 Ford Mustang by about 20 millimeters to make it appear leaner and more athletic. Ford’s decision to drop its 3.7-litre V-6 engine from the 2018 Mustang means increased production at the automaker’s Windsor, Ont., engine plant, the union representing workers there says. Ford axed the engine in favour of the 2.3-litre EcoBoost and 5.0-litre V-8, which is built at Essex Engine Plant. “We’re expected an increase in demand for engines built at the Essex Engine Plant,” Unifor Local 200 president Chris Taylor said. Ford says the 3.7-litre V-6 engine accounts for roughly 15 per cent of sales. The V-8 engine itself has been upgraded and now includes direct injection and port fuel injection, which will increase fuel efficiency and horsepower ratings. The engine is also used in the popular F-Series pickups. “We’re looking forward to the results of that. I’m sure customers are going to be very happy,” Taylor said. Ford also said its EcoBoost engine will have increased torque. The redesigned Mustang also includes a lower hood, with vents, and an optional spoiler. It also gets an optional 12-inch digital cluster, new-generation LED headlights and taillights available across all trim lines, and a number of new tech features. Ford last redesigned the Mustang in 2015 and took it global, currently selling it in 140 countries. It will expand that number to 146 with the 2018 model-year car. Canadian sales increased nine per cent in 2016 when the automaker sold 7,655 units, up from 6,933 in 2015. However U.S. sales fell 13 per cent, down to 105,932 in 2016. Taylor said the union has reached out to Ford to ask for specific projected volume numbers but has not heard back. “We don’t expect it to mean an increase in the number of jobs, though,” he said. But, the promise of a new engine program in Windsor could one day mean more jobs. Under the terms of a contract reached between Ford and Unifor in October, 2016, the automaker agreed to spend $700 million on its Canadian operations. The overwhelming majority of that money will be spent on engine operations in Windsor. Taylor still doesn’t know what Ford has planned for Windsor’s engine program. “We would always hope, specifically for the Bronco, that the 5.0-litre is an option in there, but we haven’t heard one way or another,” Taylor said. At the North American International Auto Show in Detroit on Jan. 9, Ford confirmed the Bronco SUV will return to production in Michigan in time for 2020. Taylor previously said retooling at the Essex Engine plant will start in 2018 with a production launch expected sometime in 2019 or 2020.